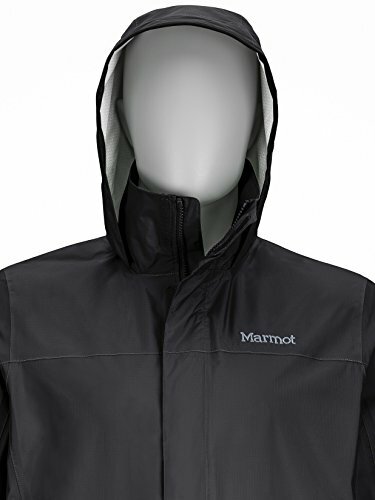 The Precip Rain Jacket is a popular and versatile option from Marmot. It ticks a lot of the boxes I'd look for in a basic rain jacket at an affordable price. Let's take a closer look. A basic but functional and lightweight rain shell, the marmot Precip will pack away well in any day pack. At a very reasonable price, it's a good option for many hikers. 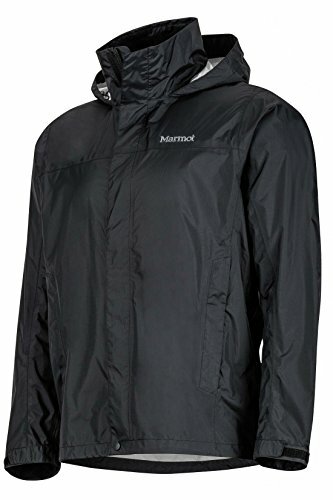 The Marmot Precip Rain jacket for men is a popular rain jacket from Marmot. It’s a 2.5 layer constructed jacket that utilizes a microporous coating with a dry touch finish to give rain protection, we’ll expand on what those items mean more in the detail below. The Precip came to my attention some time back as it is a prominent favorite with users across many retailers and other gear review sites. The User reviews stacked up pretty good across the board too so I was interested to learn more. In an overall summary, the Precip is a basic rain jacket model falling in and around the 100 dollar price mark, give or take 30 or so dollars e.g. if you get it on sale or the like. In my opinion it falls into the desirable category for hiking rain jackets. That is, it won’t break the bank and is functional enough to keep rain showers from getting you soaked, while preventing you from getting too stuffy inside in the process. It comes with most features I would expect a decent rain jacket to have. Let’s take a closer look. The Precip is listed as waterproof. The waterproofness is measured at 10,000 mm minimum JIS-L 1092 (Hydraulic pressure test AKA the Water column test). That basically means that if you put a square tube with inner dimensions of 1” x 1” over a piece of fabric from the jacket, you could fill it with water to a height of 10,000 mm (32.8 feet) before any water would begin to leak through. As you can guess, the higher the rating number, the more waterproof the fabric. From the many user reviews I read, while many folks complimented the waterproof capabilities of the Precip jacket, I did note some people saying the jacket didn't perform so good. This is something I always have a little bit of difficulty with as I am never sure if peoples expectations are appropriate. To be clear, nothing is truly 100% waterproof, unless it's made from PVC or something but that just isn't practical to consider as a hiking jacket. I’ve yet to find a hiking jacket that doesn’t wet out eventually given enough punishment. With that in mind, for a 100 / 150 dollar mid range rain jacket you should set your expectations accordingly. An autumnal day with rain showers coming and going, you should be fine. A 10 hour torrential downpour, it ain’t going to cut it … but not many jackets will, even Gore-tex 3 layer jackets will get a run for their money. While you can get jackets that perform better, I feel that you need to move into the $300 to $500 category to see a significant difference in performance. Now, as with any rain jacket, the waterproof capabilities come via the water repellent finish. This will wear off over time so you really need to take proper care of your jacket to get as long a life as possible out of it. For those who aren’t familiar with that, the water repellency is a finish on the outside of the jacket that makes water bead and roll off your jacket. You need to treat your jacket well and retreat it with a DWR replacement product every do often to keep that capability longer term. Next up, I want to take a look at breathability. Many of you will know what that is but for those who don’t, in brief, breathability is about how much hot air and condensation, your sweat, can get out while not letting rain or moisture get in. To expand a little further on that, the fabric of the jacket has to be thick enough to keep water molecules from getting in but thin enough to let air out from the inside. This is also known as wicking and you can learn more about that here. This next bit will get a little technical sounding but it basically means the same thing. The Precip utilizes Nanofabric. This Nanofabric does what we just reviewed, let’s sweat and heat condensation out while keeping rain from getting in. The Nanofabric on the latest Precip is listed as being 43% more effective than previous Precip technology so it’s an ongoing development. Always nice to see a brand consistently improving their offerings. It’s worth noting that the jacket is also listed as wind resistant but most reasonably decent waterproof rain jackets generally are. In terms of technical scoring, the Precip scores 17,000 gm / 24h minimum JIGS-1099 B1 and an impressive 5.0 to 5.4 on the Hohenstein RET. Not to get too carried away with technical jargon but the Hohenstein RET is a test that measures the evaporative heat loss of fabric. They do this by combining RET values with qualitative feedback from testers wearing the garment while working out on a treadmill. The highest scoring bracket is 0-6 which represents ‘Very good or extremely breathable. Comfortable at higher activity rate.’ So, the Precip reaches top rating here. To further help with breathability and comfort in terms of stickiness inside the jacket, the Precip has a DryTouch finish next to the skin. This helps to further reduce the chances of feeling like your inside a boiler room when exerting yourself while wearing the jacket. As with waterproofness, breathability is a limited thing that I always find very hard to judge when it comes to fabric. With differing temperatures and exertion levels, it can be hard to blame a jacket unless it’s made of PVC or something which would be like being in a sweat house. However, what the Precip has as a further aid to internal comfort and temperature regulation are pit zips. If you’re not familiar with these, they are zips under the arm pits of the jacket which can be opened to act as ventilation ducts, if you will. These are effective when you need to cool down so I think those combined with the breathability capabilities of the Precip should see you right. In terms of comfort, the men's Precip rain jacket seems pretty well constructed. In terms of hiking, the main thing you want to be thinking about is having enough room to allow layering. From the many user comments I read, the Precip scores well in this area and there are a whole host of sizes to chose from. The next thing that this rain jacket has going for it is something called ‘Angel Wing movement’. If you’re not sure what that means, just think of making a snow angel. You move your arms up and down to get the angel wings effect on the ground. Well, same thing here but doing it upright. Not to labor on the point but basically means you can swing and rotate your arms in circles and the jacket won’t ride up your back. Now, this may seem like a minor thing but in my personal opinion, a back riding up your back is a real pain in the a**! If you’re wearing any kind of a pack going up over steep terrain, say rocks and scrambling a bit, it can be really annoying and when it worst affects you is of course when you're in the least position to do anything about it i.e. hanging onto rocks scrambling up a steep mountain side. Not ideal so a wider range of arm movement is definitely a good thing to have! In terms of sizing most people reported it fits true to size but if you’re going to use it for heavy layering, maybe consider an extra size up. Weight is of course an important consideration when hiking. You can always try and get a multi-layer jacket that protects you from hail stones the size of golf balls and torrential rain, but it won’t be much fun to either wear or carry hiking up a 3000 meter peak! This is where I feel rain shell jackets really come into their own when it comes to hiking. Although you may not get the most waterproof jacket or maybe not the most breathable jacket available, what you will get is reasonable performance across both of those areas in a jacket that is lightweight and easy to wear and carry, at a reasonable price. That’s the trade-off and I think it’s a fair one in most cases. As mentioned at the top of this review, the jacket is 2.5 layer construction and has 100% taped seams. The jacket is pretty durable for the trail but, as mentioned above, you need to care for and maintain it appropriately to get as long a life as possible out of it. In terms of packing the jacket away, the Precip rain jacket rolls up into its own pocket so it can be easily stowed away. Always a nice option to have when space in your pack is not abundant! The light weight build of this jacket and it's ability to easily stow away was repeatedly mentioned by many users of the Precip, a repeating positive across the board for sure. In terms of features, the Precip has nearly everything I would look for in a rain jacket for the trail. If we start from the top, we have the hood which is fully adjustable via a peripheral cord. I really like the slight peak on the hood as it provides good visibility even in bad weather. That little bit of stiffness in the hood means that even in heavy winds, the peak should stay in position and not get blown into your face impeding your vision. It’s also worth noting that the hood is large enough to accommodate most helmets. Moving further down we have the DriClime® chin guard which wicks away moisture. The Driclime® is soft on the inside and so, feels nice on the skin providing protection and comfort without irritation. The front of the jacket has a stormflap which closes over the zipper using hook-and-loop closures. The hem of the jacket is adjusted by drawcord as required. These are usually pretty standard in most jackets and usually work pretty well. Combined with Angel Wing movement, the jacket will stay in position when it’s set. The cuffs are also adjustable via a Velcro strap which works pretty well. All the above means you can get a secure internal area together surrounding your body to keep the elements at bay. I think the Marmot Precip is very well priced for what you get. It sits in the mid to high range of the rain jacket category, more in the mid, and you get a good level of functional capability and practical features for your hard earned green. You can check the live price for the Precip by clicking on any of the links in this page. I think for most hikers the capability available in the Marmot Precip should be adequate to see them through. The jacket is also immensely practical for day-to-day use too so definitely something that can be utilized across multiple scenarios. Of course the first and foremost use for the Marmot Precip Rain Jacket for men is of course for hiking. It is suitable for 3 season use, possibly 4 depending on the winter conditions. As it’s lightweight and very packable, it will be a grand companion for any backpacking trip. Aside from hiking, it is suitable for most outdoor use e.g. cycling, fishing, camping, etc. On top of that the Precip rain jacket boasts a pretty smart design so it is also perfect for general day-to-day use too, whether heading into town for shopping or out walking the dog! As of the date of this post, from about 330 reviews we totaled across various retailers, 72% of people gave the Marmot Precip 5 stars and 92% 4 stars or more! That’s a pretty good batting average by most peoples standards. 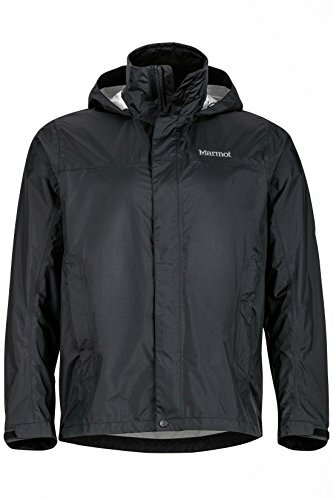 The Marmot Precip jacket for men is probably one of the best jackets available in the rain jacket category today. You get a lot of capability for a very good price and you can tell it has been designed with the outdoors in mind. It’s probably a 3 season jacket but you might get 4 out of it on better days with good layering, depending on the climate of course. Overall, it’s versatile enough to take backpacking on the PCT, day hiking in your local mountains or just walking the kids to school. If you’re in the market for a rain jacket for the trail, you could do a lot worse than getting the Marmot Precip Rain Jacket for men. As always set your expectations appropriately and be sure to read user reviews yourself to get a feel for the pros and cons from people’s experiences with it. If you're still not sure, check out our 10 best hiking rain jackets for men, where we list out our top men's rain jacket recommendations. Do you have the Marmot Precip? What are your thoughts on performance and functionality? I'd love to hear them in the comments below. The review date could’ve been included as it’s not listed. Will have to wait until it arrives to check the fit and then see how it performs. Hopefully the jacket performs well, as noted in your review, that there are basically mixed reviews online from good to bad about the jacket’s condition and performance. Wetting out is one thing but moisture underneath from a ‘waterproof’ shell most likely mean that it’s perspiration and that the jacket’s membrane isn’t letting that perspiration out, provided there’s nothing wrong with the seals or fabric. Looks like it can be worn as a lightweight shell jacket with some light-/mid-weight fleece underneath on dry but cold and windy days. Already have a heavy duty Gortex Arcteryx Theta for the cold winter period but needed a lighter weight shell jacket for general wear when needed. Thanks Michael. I’m glad you found it useful 🙂 I actually first published the review back in May 2014 but I updated it earlier this year if I recall correctly. I will look at having the dates showing on the reviews, would make more sense for sure … thanks for pointing that out. I think for $55 you got a good deal! The Precip is basic enough but functional. It is a basic rain shell as you say, and it is lightweight so easily packable. I think it is spot on for use in Spring to Autumn in temperate climates both on and off trail. I agree that you would be better using something heavier, like your Arcteryx Theta, for Winter. There’s definitely room for layering with the Precip though so fine for a cold and windy Autumun day with a fleece on. I had noticed some mixed reviews online as well. Sometimes I felt that expectations were too high from some folks, but I did note some people having bad experiences with it in terms of performance and so on. I of course saw plenty of folks who loved it too though. In my opinion, I think it’s a decent and functional option for a reasonable price. I hope you like it and get good use out of it!